This makes me giggle. I finally got the old iMac all apart (a fight) and reassembled sans guts (another fight). Soon it will have some form of plant light in it. 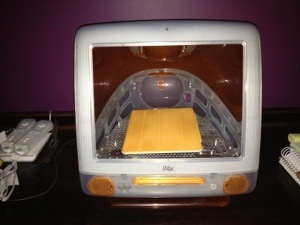 But in case anyone was wondering just how far Apple has progressed in the last decade and change…. This is my iPad inside my old iMac. Oh, technology…. No moss growin’ on you, that’s fer sure and certain. Now I use my phone to take pictures, which I upload through an app. (There is an entire generation growing up which thinks that phones taking pictures is normal. I am terrified.) I add words and captions via a tablet. (Remember when tablets were just another shape for painkillers?) I do a two step process because I cannot possibly physically wait for my magical photostream of automaticity updating joy to get around to automatically updating, not can I be bothered to walk down the hall and sync with the actual computer. I want my magic NOW, gosh darn it! Everything is awesome, and life is amazing. My point is, I constantly feel like I am failing for not keeping up, and then I look at how far things have come. Everything is different since I bought that iMac – different, and amazing, and awesome. Next Who am I next? Sometimes in the next oh, ninety days or so, the last generation that looked a their computers via CRT’s will purge their memories of it all.